As shown in figure 4-23, thrust blocks should be installed on water mains at all changes of direction to prevent pipe from separating from water pressure. 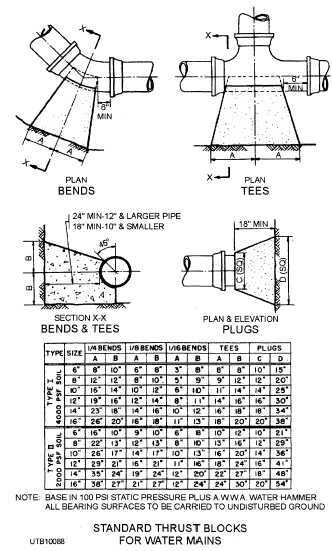 Consult the chart at the bottom of the figure for dimensions of the thrust block according to the pipe size and compaction rating of the soil. The primary purpose of insulation is to prevent heat passage from steam or hot-water pipelines to the surrounding air or from the surrounding air to cold-water pipes. Thus hot-water lines are insulated to prevent loss of heat from the hot water, while drinking waterlines are insulated to prevent absorption of heat in drinking water. Figure 4-23. - Thrust block pipe supports. consists of droplets of moisture on the outside of a glass of ice water on a warm day. The same thing happens to the outside of a pipe containing cold water when the outside of the pipe is exposed to warm air. Insulation also prevents water from freezing in a pipe, especially when the pipe runs outside a building or in a building without heat. Insulation is used on heating and air-conditioning ducts. The two kinds of duct insulation are (1) inside and (2) outside. The outside insulation is for the protection of heat loss, whereas the inside insulation is used for protection against noise and vibration from heating or air-conditioning equipment. Insulation subdues noise made by the flow of water inside pipes, such as water closet discharges. Bathrooms directly above living rooms should be insulated. Insulation is vital in high buildings where water falls a long way, especially when the water falls in soil stacks and headers. Insulation also protects refrigerated and chilled waterlines that cool electrical and motor-driven equipment. Insulation is made in two forms: (1) rigid preformed sections and (2) blankets. Rigid preformed sections are used on pipe runs and to protect other objects which they are designed to fit. Blanket-type insulation, manufactured in strips, sheets, and blocks, is wrapped around objects that are irregular in shape and large, flat areas. Blanket-type insulation protects against heat loss and fire. This type of insulation is used on boilers, furnaces, tanks, drums, driers, ovens, flanges, and valves. It comes in wool-felt and hair-felt rolls, aluminum foil rolls, and in an irregular preformed covering. Blanket insulation comes in different widths and thicknesses, depending upon the type of equipment to be insulated. It resists vermin, rodents, and acid. It is also fireproof. Some of the insulating materials on the market today for insulating pipe are sponge felt paper, cork pipe covering, wool felt, flex rubber, fiber glass, magnesia, and types called antisweat and frostproof. Sponge felt paper is composed of asbestos paper with a maximum amount of sponge evenly distributed within it, as shown in view A, figure 4-24. Sponge felt paper is manufactured to fit most pipe sizes. It comes in 3-foot lengths and from 1 to 3 inches in thickness.